Leisure Line’s maximum in home heating. This unit is the same as the Hyfire I, but with twin 90,000 BTU burners. Heat ranges from 5,000-180,000 BTU’s can be expected with this unit. If you’re the person who wants the most from their heating dollar, then the Hyfire II is the one for you. 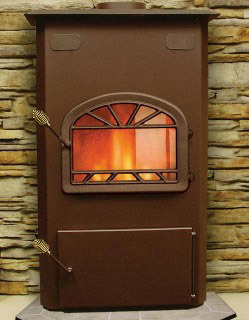 Both Hyfire stoves can be ducted directly to an existing hot air furnace.